In the past decade, 18 feet have been discovered along the Pacific northwestern coastline. Over the past decade, British Colombia has found itself in the middle of a strange mystery. 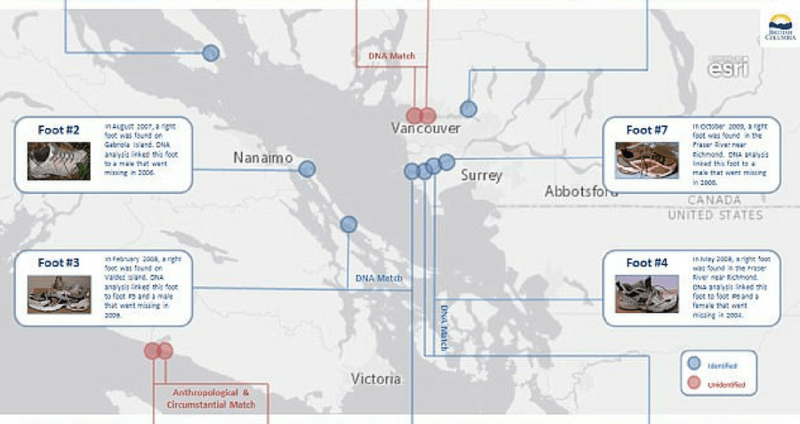 Since 2007, 18 separate severed feet have washed up on the coasts of British Colombia, and parts of the northwestern U.S., from Tacoma, Wash. all the way past Vancouver. The most recent find came on Dec. 8, when a man walking his dog found another severed foot, inside a shoe and attached to the lower part of a leg. A news report from CNN stated that 13 feet have been found, while a Wikipedia page on the subject claims the number is now 18 as it takes into account all of the found feet along the shores of the Salish Sea, not just the the ones in Canada. “Our early analysis suggests these are human remains and we will do further investigation and testing … in the coming weeks,” BC Coroners Service spokesman Andy Watson told CNN. According to the coroner’s office, all of the feet and leg remains found have been human. Authorities report that they don’t expect foul play, though the origins of the feet still remain a mystery. They do not believe that the feet are in any way connected. A few have been matched to bodies and a few to each other. Two of the feet found were left feet, which were later matched to corresponding right feet. While authorities can’t comment on where the feet originated, that hasn’t stopped the rumors from flying. Though finding severed feet is not uncommon, as the ankle is relatively weak and feet often break off from the body during decomposition, finding severed feet but virtually no bodies is rarer. One theory is that the feet belong to bodies of tsunami victims, possibly people who got stuck in boats during storms, or victims of plane crashes. Despite the coroners’ report that foul play was not involved, some people have suggested that this is the work of a serial killer, as even bodies that have been weighed down in water would have their feet fall off during decomposition. So far, at least four of the feet have been matched with bodies, one of a man who committed suicide in 2008, and one of a woman who committed suicide in 2004. Now that you’ve read bout the Salish Sea severed feet, read about the megalodon teeth that keep washing up on North Carolina’s coast. Then, read about the guy who kept 9 dismembered bodies in his apartment.